The other day, when my aunt asked me if I was planning to make Neyyappam this weekend, she sparked a new recipe–reinventing tradition, as I like to call it. Neyyappam is a dessert that Tamilian/Keralan families make for a festival called “Avani Avittam” made of rice flour, brown sugar, coconut, cardamom, etc and fried like a fritter or doughnut in neyyi (ghee/brown butter/clarified butter). I hesitated when she asked for a few reasons: I don’t have the special pan needed to fry the dessert, and I only really like neyyapam when it’s hot, crispy and fresh off the stove–I think they’re kind of a waste of effort otherwise :). But we started talking about alternatives, and came up with baking them in a muffin tin. 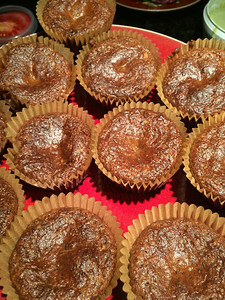 Yesterday, when it came time to make them, I decided to not just use the traditional recipe but bake them, as I found out just now that someone else has already tried & blogged about, but to futz with the recipe while I was at it to make them into breakfast muffins that have the flavor of neyyappams. Normally I don’t use butter much in my muffins, but for this, I needed the flavor of neyyi. If you’re looking for a traditional baked neyyappam–substitute out the eggs (use 1/4 cup yogurt instead), and put the rice flour back in. You can try this recipe. (I swear I only landed upon these now when I was looking for a link to the traditional neyyappam recipe to link to for a comparison! 🙂 You also might want to add more sugar (i did a very low sugar version). heat a small pan and add butter. cover with a lid and let bubble away until it is browned (usually for neyyi you just let it melt until clarified, but i went the additional step for the flavor of browned butter). pour batter into muffin tins and bake until golden and a knife comes out clean, roughly 20 minutes. This entry was posted in breakfast, Recipes, vegetarian and tagged banana, brown butter, cardamom, coconut, indian, muffins, neyyappam, vegetarian. Bookmark the permalink.